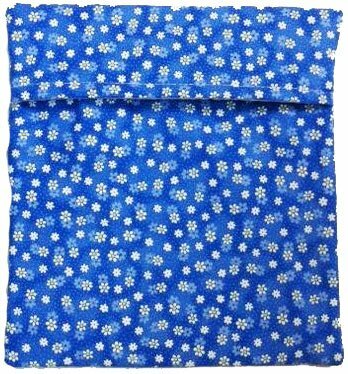 This whimsical print has a sky blue background with spring white daisies scattered throughout. Our regular size premium microwave potato bags measure approximately 10x10 inches. They will hold 1-4 medium sized potatoes or 1-2 sweet potatoes. Each bag is hand made with a 100% cotton inner core sandwiched between a 100% cotton muslin lining and a 100% cotton outer shell. Our bags are sewn with 100% cotton thread. The convenient overlapping flap helps keep moisture inside to aide in cooking. Our potato bags work great to cook potatoes, sweet potatoes, corn on the cob, and squash. Use them to warm tortillas, frozen rolls, muffins, pancakes, soft pretzels and more. These bags will save you time and they are energy efficient. They are machine washable. Our bags are individually hand cut and sewn in the US. Works for potatoes, sweet potatoes, corn on the cob, tortillas, frozen rolls & more. Simply wash potato & microwave. A perfect potato in minutes. If you have any questions about this product by MicrowavePotatoBags.com, contact us by completing and submitting the form below. If you are looking for a specif part number, please include it with your message.